Driving through a neighborhood in an older part of town, my son asked me, “why do all these houses have such big front porches?” He thought it was a waste of space. I explained to him that people used to come home from work, eat dinner together as a family, and then sit out on the front porch. They would visit with neighbors and friends, tell stories, and quietly watch the world. Things have changed a lot since those days, mostly for the better. But one thing that we have lost in our modern world is moments of quiet. In fact, we are so inundated with noise today that we often become uneasy if things get too quiet. The TV is on, whether anyone is watching it or not. The radio fills our cars with music and commentary. The phone rings, cars honk, the dishwasher swishes, the computer hums. iPods, smart phones, and MP3 players follow us 24 hours a day with music and information wherever we go. All of these things are useful and necessary–they make our lives both productive and enjoyable. But, there is something missing in this busy, hustle-and-bustle, noisy life: a little peace and quiet. We spend so much time interacting with the outside world, and with the media, that I fear we are losing our relationship with ourselves. As humans, we need to take quiet time for introspection and rejuvenation. Think about it. Even your computer cannot continue day after day, week after week without occasionally rebooting. You, too, need to reboot. Whether you choose to meditate, take a walk, pray, write in a journal, or just sit and think, the important thing is to block out some quiet time. It doesn’t need to be long, just a few minutes a day with no electronics, no music, no news, no one telling you how to think or feel, and no addenda: just you listening to your inner voice and cultivating calmness. You’ll find it’s harder than you think. But, you’ll also find that it is absolutely worth it. Moments of quiet solitude add strength and stability to the rest of your day. You will make better decisions, feel more calm and rested, have improved relationships, and be more comfortable in your own skin. These moments of quiet help you decide what is most important in your life. They help you prioritize and plan. They recharge your mind and help you to mentally sort through the mountain of information that bombards you day after day. 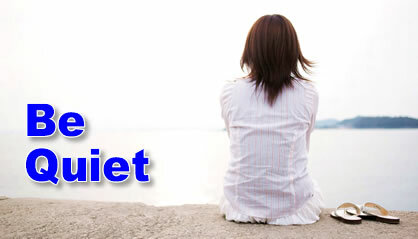 Success Tip: Take 15 minutes a day to be quiet. Find a peaceful place where you can be alone. Turn off all electronics and just enjoy being with yourself. Listen to your inner voice and cultivate peace in your life. Bring a pad and pencil to jot down the ideas and thoughts that come to you. Then, jump back into life, refreshed, invigorated, and prepared to take on the day. Every minute you are unhappy is a minute you’ll never get back. We must encourage others and build each other up. This is an important concept that is being squeezed out of our busy lives. Some people think that the more busy they are, the more important they are. Sadly, they are not important, just busy. Thanks for the reminder! I get so busy that I hardly have time to think. Here is a bit of prose I wrote several years ago. Every living creature has a need for quiet time. Nor to feel the dissension of the world outside. But to be alone, alone with cherished thoughts. Previous post: Be a Driver!